Prof. Shechtman is Distinguished Professor, The Philip Tobias Chair, Technion-Israel Institute of Technology, Haifa, Israel, an Associate of the US Department of Energy's Ames Laboratory, and Professor of Materials Science at Iowa State University. He gained his PhD in 1972 from Technion-Israel Institute of Technology in Haifa and was an NRC (National Research Council) fellow at the aerospace research laboratories at Wright Patterson AFB, Ohio, where he studied the microstructure and physical metallurgy of titanium aluminides. In 1975 he joined the Department of Materials Engineering at Technion. In 1981-1983 he was on sabbatical at Johns Hopkins University, where he studied rapidly solidified aluminium transition metal alloys (joint programme with NBS, National Bureau of Standards). During this study he discovered the icosahedral phase which opened up the new field of quasiperiodic crystals. "His discovery was extremely controversial. In the course of defending his findings, he was asked to leave his research group," the Nobel committee at the Royal Swedish Academy of Sciences said in a statement. "However, his battle eventually forced scientists to reconsider their conception of the very nature of matter". Scientists are currently experimenting with using quasicrystals in different products such as frying pans and diesel engines. 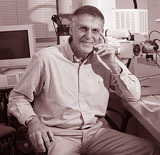 Prof. Shechtman's Technion research is conducted in the Louis Edelstein Center, and in the Wolfson Centre which is headed by him. He served on several Technion Senate Committees and headed one of them. He is a recipient of the 2008 European Materials Research Society (E-MRS) 25th Anniversary Award, the 2002 EMET Prize in Chemistry, and has also received the Wolf Prize in Physics (1999) and the Israel Prize in Physics (1998). He is a member of the European Academy of Sciences, the American National Academy of Engineering and the Israel Academy of Sciences. The information on this page is based on content at Nobelprize.org © The Nobel Foundation and Prof. Shechtman's page at Technion-Israel Institute of Technology.